Gerald “T-Boy” Broussard Sr. grew up in Crowley, Louisiana where he began playing guitar and drums. His musical talents allowed him to begin playing professionally and recording songs at the age of only nine. 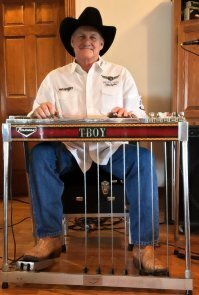 He is best known for playing with "Camey Doucet, Jimmy Thibodeaux & Musique," "Wayne Toups & The Crowley Aces" and "Ozenne Guidry, L.J. Broussard & The Lyons Point Playboys." He also recorded with “Milton Adams & The Midnight Playboys.” Broussard has also played with several iconic cajun musicians such as Aldus Roger and renowned accordion maker Shine Mouton. Broussard also played with Camey Doucet and Jimmy Thibodeaux on television programs, including Passe Patout. Broussard was also a studio musician recording on several songs in the 1970's. He is included in the book, Memories - A Pictorial History of South Louisiana Music 1920-1980's by Johnny Allan. Several of his early recordings are still popular today, especially "The Wedding March,” "Hey Mom" and "Hold My False Teeth.” Today, these songs are played at almost all Cajun wedding celebrations.